It was getting harder to find the ingredients. Now almost all of the time his daughter spent with him they wasted in travelling to far-flung villages, seeking the stones and herbs of his craft. He was reviled as soon as people divined his purpose, and stones were flung at his head as readily as curses. One day a villager would strike true, and then he would be the one on his way to the underworld. But this time he had a plan. He had arranged to meet a man who could get him what he needed. As they entered the inn, dusting the snow off their hair and shoulders, Pan surreptitiously eyed the people in the room. Other than the innkeeper and a few children, there were two strange men. One of them was wiry, and sat far from the fire, but with a lamp on his table. He was scratching vigourously with a quill on parchment. The other man was burly, and bearded. He looked them over as they entered, a little contemptuously. Pan thought he must be the one, but it would be rude as well as suspicious to join him without an invitation. He told Yuka to sit by the fire with the other children who were doing their homework, and he found himself a place at a table where he could watch the burly man. With the few coins he had earned from charming talismans for some traders, he ordered food for himself and his daughter. The burly man made no move. When the food came, her father called Yuka to come and eat. He gave her all of the seaweed, even though she hated it. “You need to stay strong,” he said, when she made a face. There was a laugh from behind him. It was the wiry man. He stood up and came to stand near them. “Sure.” The man sat down next to Pan, taking no notice of the hostile looks the father cast him. Then, reaching over to the girl’s plate he picked up a piece of the seaweed between thumb and forefinger. Pan tensed. There was so little food already, for the stranger to steal theirs was insufferable. Yuka did so, but choked. Her father stood up in alarm, pouring some water out of the pitcher for her to drink. The children by the fire looked up to see what was the matter. “She’s going to puke,” said one of them. But the water helped, and in a few moments Yuka was breathing freely again. Pan turned on him. “What do you think you’re doing, inviting yourself to our table, and nearly killing my daughter?” he demanded. Pan couldn’t hide his astonishment. He looked at Yuka to see if she had heard, but she was busy scraping the seaweed to one corner of her plate. So this was the man he had come to see. As he opened his mouth to speak, the man tapped Pan’s pocket. Their eyes met. Pan reached the fingers of one hand carefully into the pocket, keeping it hidden from the burly man’s sight. Inside the tattered leather lining, he felt a piece of parchment. He hadn’t noticed the stranger put it there. The man nodded, and stood up. “Good eating, and thanks for the seaweed,” he said. Then he poured some of the milk on the altar for the gods, and pulling on his furs, left the inn. Pan chewed on a piece of seal meat without tasting it. He glanced at the other children sitting by the fire, and then at his daughter, and he thought that she looked thinner, and tired, and as if her eyes were older than her face. He shook his head. Of course, she had been through a lot, because of her condition. But he wished he could give her a better life, something better than just keeping her alive. As they were finishing their food, the burly man stood up and went outside to relieve himself. Pan took the opportunity to inspect the parchment in his pocket. It was a simple pictogram. Was the man illiterate? No, he had seen him writing when he entered the inn. Perhaps he thought Pan might be illiterate. The drawing was of a path leading away from the old oil derrick, into the forest, and the time was marked by the lower horn of a crescent moon just scraping the horizon. He knew exactly what that meant. The night was cold, and quiet. As they approached the meeting-place, the only sound was the crunching of their feet in the icy snow; his longer strides syncopated by Yuka’s shorter ones. They were quite near before they saw the man. His silhouette had merged into the tree against which he was leaning, but in the sudden flare of a match as he lit his pipe, they saw his face clearly. Clearer than they had seen it in the dim inn. It was unremarkable, but difficult to describe. “Are you the thief?” asked Pan, stopping in front of him. “Maybe you could find a medicine man. Though I don’t know what you’re worried about. Little girl looks alright to me.” He looked over Pan’s shoulder to watch the girl. She was sitting in the snow, drawing something with a stick. The thief had been mixed up in a lot of ill-work in his time, but he had never been a party to murder, nor did he intend to be. “The chief’s a wise man,” he said. “Not enough of those around these days.” He chewed on his pipe, and watched the girl with a thoughtful expression on his face. Was her father insane? Dangerous? What kind of life was he leading her? “If he were wise, he would share the stone with the rest of the people, instead of keeping it to himself,” hissed Pan through his teeth. The slender moon had set and left them in twilight, punctuated only by a single hut-light glinting through the trees. It was difficult for Pan to see the stranger’s expression, but he noticed the direction of his gaze: watching Yuka again. Pan nodded. Why he should be afraid of this man when he himself had power over life and death, he didn’t know, but he was. “Let me cast a protection spell on you, at least,” he said. The stranger loosened his hold and allowed Pan to do his work. “You’re an idiot,” he said to himself, as he padded silently along the roof of the ceremonial hut. He had never accepted a job without payment before, and for such a man as that! But it wasn’t the man who had changed his mind, it was the girl. There was something about her… He had once known a necromancer who had told him that sometimes it was possible for the ancestors to cast spells of recognition, so that they could know each other in their new form when they were reincarnated. Perhaps he had met the girl before. He liked the idea because it made him feel less a fool. He lay on his belly and shuffled inch by inch towards the smokehole. He listened, but hearing nothing, he took out a small handful of crushed herbs from the pouch at his side, and sprinkled them in a slow, steady stream into the fire below, holding his breath as he did so. He was used to the effects, but he wanted to be sure he was clear-headed. Now he would have to wait while the magic took effect, and he could sneak through the ceremonial hut and into the cold room unseen. He decided to smoke a pipe – no one would notice the thin stream of smoke mingling with the larger cloud from the smokehole. After half an hour had passed, he deemed that the guard would be asleep. He tucked his pipe into his belt, stood up, and then holding onto the bones of the roof, lowered himself in, jumping free of the fire. He was just looking around when a strong kick to his shin made his leg buckle. He grunted, but spun around and away from his assailant, putting out an arm to ward off any blows. So much for the necromancer’s protection spell. As he had expected, the guard swung at him. A stick broke on his forearm, but as it did so he caught hold of the attacker’s wrist. It was slender. “You!” said a female voice. She stepped out of the shadows and he recognised her face. “What do you think? Guarding the spirits of our ancestors from thieves like you.” She licked a finger and rubbed the soot off his face. He knew she would let him have what he wanted, in return for what she wanted. “A little girl. Yours?” He didn’t miss the hint of jealousy in her voice. “No, of course not. I wouldn’t steal from the chief. Only from his daughter.” He gave her a quick kiss. “That doesn’t sound so bad,” he said. But he didn’t let her finish. “Did you get everything?” asked Pan. It was the next day, though the sun hadn’t risen. The two men were back at their meeting-place, as arranged, except this time the girl wasn’t there. “She’s playing with the innkeeper’s children,” her father told him. He held out his hand for the bag slung across the thief’s shoulder. Pan smiled, but before he could answer, a crack and crackle sounded in the sky, and with blinding brilliance, the aurora tore across the darkness. “No. No. Not yet. It’s too soon,” whispered Pan. He gripped the satchel and began running back to the village as fast as he could. He didn’t see the bandages that spilled out, or hear the thief calling after him. The thief had seen this before. The necromancer he’d known had told him that purple in the aurora always meant one thing – the souls of dead children. He picked up the fallen bandages, and dashed after Pan. When he arrived at the inn, the row had already begun. Pan was holding the limp body of his daughter, and pleading with the innkeeper to allow him to use one of the rooms, but the innkeeper wouldn’t budge. She was standing stolidly in front of the stairs, her rifle pointed at him. There was no danger of missing him and hitting the little girl. She was already gone. Tears streamed down her father’s face. The thief wondered how many times he had already seen her dead. How many times he had held her limp body and faced the worst fear: that he wouldn’t ever be able to bring her back again. But the innkeeper shook her head. “I’m sorry,” she said, stroking the head of her own little boy who had sought refuge behind her legs, and was watching the scene in confusion. “I wouldn’t dream of it, chief,” he said, but without conviction. Pan released his daughter. Raven had seen many dead bodies. He thought her face looked peaceful. The braids of dark hair were crossed on her still breast, and the fingers of one hand were curled as if pointing the way. Raven didn’t believe in an afterlife, but he didn’t think much to this world either. It had taken from him the one woman he had ever truly loved, and not even the most skilled necromancer could have brought her back. What sufferings would the world have inflicted on this child? Her father was poor, and desperate, and her mother was dead. It was better to leave her to rest. Pan began rocking back and forth, mumbling something between sobs. They might have been incantations. The chief nodded. “We’ll take her to the ceremonial hut. He can say his prayers there.” He motioned, and one of the men came forward to pick up the dead girl. It was the distraction that Pan had been waiting for. He stood up, and with a speed that must have been aided by magic, he took the rifle that the innkeeper had laid down, and pointed it at the chief. Raven stepped forward instinctively to shield the chief, even as his men rushed to do the same. But it was Raven who took the bullet. As he fell into the chief’s arms, the stone hanging around the man’s neck swung before Raven’s blackening vision like a pendulum. Not knowing how, or why, he reached out a hand and grasped it, just before the darkness enveloped him. He woke up naked, and certain that he had been screaming for a long time. When the shaking diminished he was able to sit up, despite the needle in his arm. He was in a hospital room in the underworld. He knew this was the underworld, because he had been through all of the gates, and he had given up everything. And he knew, because the person who walked into the room was the woman he had loved and lost in the other world, and the one who had brought him back to life in this one. “You?” she screamed. “You were helping her father? You’re her father, you fool. Do you know how many times I’ve had to bring her back? She’s strong, but I don’t know how much more I can take.” She held his face, digging her fingers into his hair. They were both crying now. She stepped away from him, drying her eyes. Raven wanted to fling the evil stone away, but she laid a hand over it. “Raven. I’ve missed you,” she said. “Then we will be happy here. All three of us.” He kissed her hand again, and drew her close. “Until Pan tries to resurrect Yuka again,” she said. “Like you did?” he asked. It was a mistake. Her eyes flashed angrily. “Her life here is much happier than anything he could give her,” she said. “We could have had a happy life,” he said, stroking her hair. He couldn’t blame her for her bitterness. “I’m sorry. I’ll never leave you again. I promise.” He pulled her into his arms. She stayed there for some moments, then she pushed him back on the bed. “You need to rest,” she said. He didn’t resist. He felt exhausted. Raven’s eyes flew open. He tried to resist the curtain of darkness that was drawn across his sight. He fought with all his strength. He fought. And lost. 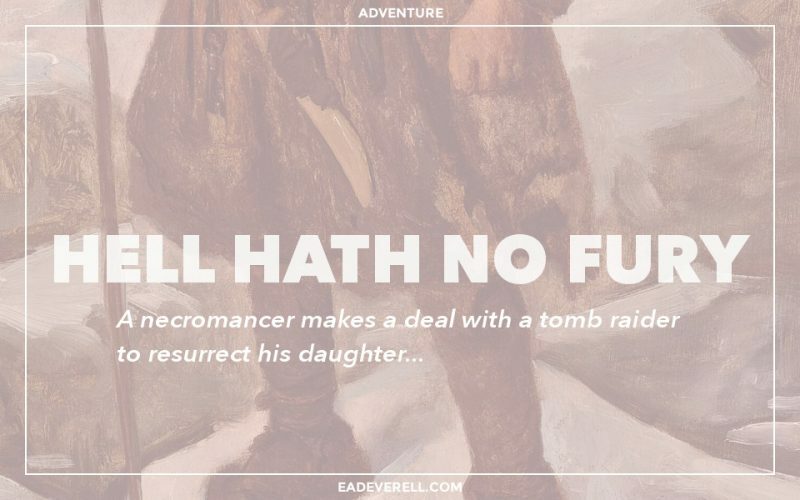 I’ve had the idea of writing a romance between a tomb raider and a necromancer for quite some time, mainly because I thought of them as natural enemies, and enemy to lover is one of my favourite romance arcs. But I always tried to create a huge epic adventure out of it and… failed. The beauty of having to write a short story and finish it in a week is that your limitations are clear-cut. The story can’t be too long, so the plot can’t be too complicated, and relationships need to develop fast. 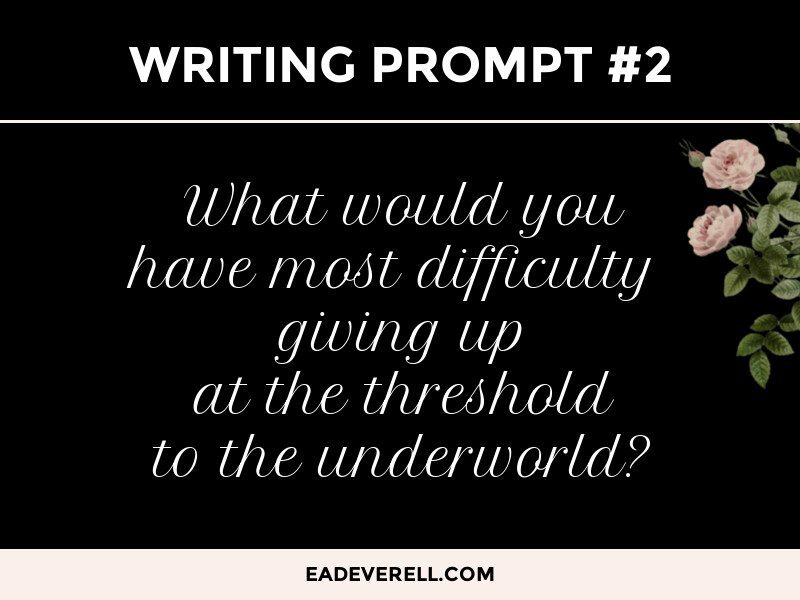 Part of the inspiration for this story came from an article I’m writing about the underworld. The rest was from some hasty research on Inuit culture: the names (which I hope are accurate! ); the belief that the aurora is the souls of dead children; and the tales of the trickster Raven. Of course, this is a fantasy world, so it doesn’t pretend to accuracy, but I would love to learn more about the Inuits, particularly their myths, so if you have any book recommendations please let me know! P.S. I must apologise for the similarities with last week’s story: adultery, bad aim, memory loss, and children. How did that happen?